So what’s so special about this new type of RSL Shed? The Sheds are a place of encouragement for all to take an interest in their own health and well-being. Good health is also based on many factors and becoming a member of the Sheds gives a person that safe and busy environment where many of these things can be found in an atmosphere of old-fashioned mateship. And, importantly, there is no pressure. You can just come and have a chat and a cuppa if that is all you’re looking for. 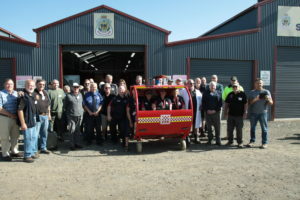 Members of the Sheds come from all walks of life – the bond that unites them is that they are people with time on their hands and they would like to do something meaningful with that time. 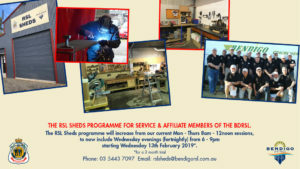 Why not come and check out Bendigo RSL Sheds? 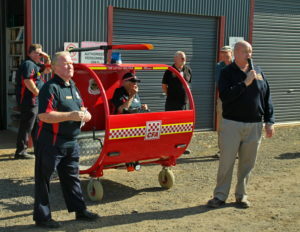 On Tuesday 26th March our wonderful RSL Sheds program presented the Bendigo CFA (Country Fire Authority) with a kids helicopter named ‘Rosie’. This helicopter is to help keep the kids entertained when the CFA talk to parents about fire safety measures at local school fetes, markets etc.